I often use the following example to illustrate the need for curriculum coherence: a primary school that had no handwriting policy. In this school children went from their Polish reception teacher who introduced them to cursive writing, to an English NQT in year one, who didn’t think it mattered, to a Spanish year three teacher who thought it did matter but taught it in the way that was different to the way the Polish teacher taught it. 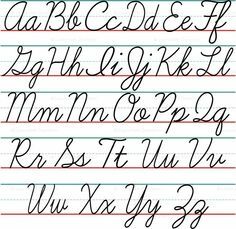 The Polish teacher had been taught cursive writing at her school differently to the way the Spanish teacher had in hers. Had the English teacher been taught it at all at her school? Even if you look to teach a style to ‘suit the child’, some sort of agreement and continuity would seem to be essential. The overall effect on the children was that there was no continuity in the way that they should approach writing, the curriculum was not joined up. This was an object lesson for me. In a discussion in another school we were talking about definitions, in the English department it seemed some of the explanations as to what things were such as to what would constitute a sentence, a paragraph etc. were different depending on the teacher. Not only were the definitions different, elements of the definitions contradicted other teachers’ explanations. Members of the science department explained that, although they might agree on definitions, what they told the children was deliberately different depending on which year they were in, e.g. the explanation of the ‘atom’ went through three different stages: key stage three was dismissed when the kids began GCSE and the GCSE explanation was dismissed by the time the pupils began studying for their A level. Maybe, how the atom is explained at different stages could be improved they thought. That my daughter was taught about climate change before she had any understanding as to what climate was baffles me and her when faced with the question ‘what does climate mean?’ If the curriculum relies on chance, on ‘not giving the whole picture’ until later or at least referring to other explanations or ideas then pupils might have a problem remembering which explanation or method they are meant to be using at any given time, especially if they ‘were away that week’. Joined up curriculum thinking would seem to me to be important. When I work with schools on the trivium this is often the point at which we start, mapping a coherent curriculum throughout a child’s schooling and ensuring all teachers are ‘singing from the same hymn sheet.’ The opposite point of view to this would be one where teachers turn up with no overall schema for their thinking. This is the culture that pins overall importance to individual lesson plans, one in which teachers are looking for tricks to get through lessons. I go as far to say that an emphasis on lesson planning hinders curriculum delivery as does looking for a hundred and one pedagogical tricks. A word-search task should only be used if it can be proved to be part of a bigger picture, not because it fills up a dreary Friday afternoon lesson in February. A culture in which whatever is in the stock cupboard will do for that day, is not one in which pupils will find it easy to make sense of what they are being taught. Having to relearn crucial things every year or so must take it out of them. Curriculum planning needs coherence. Since 1872 Harvard College has had an agreed programme for writing and it is the one academic experience required of every one of their students. The ‘Harvard’ style is well known; what are the agreed methods in your department or school and how ‘well known’ are they to your teachers, parents and pupils? How much easier would teacher’s jobs be if they weren’t forever trying to reinvent a wheel? How much easier would it be for new staff beginning at the school if they knew what children should know and when, and what this really means they should know, because all staff have reached agreement about their explanations. A joined up curriculum, ‘this is the way we do things here’; agreed and regularly reviewed could have a huge impact on teaching and learning within any school that has never addressed it in detail. The atom example is very interesting. It meta-models how science works, and leads the student through a process of increasingly realistic models that can only be understood once the previous model has been appreciated, and requires an increasingly sophisticated understanding of maths and other features that only comes as the student progresses through the years. For me, it was one of the exciting features of science, which helped me to grasp the scientific method. Is it a non-joined up approach to curriculum? I don’t think so (but I’m a scientist). The approach to science that you outline represents what I believe to be a common problem. We cannot actually describe what an atom is like. It exists in the microscopic world and we tend to assume that the microscopic is analogous with the macroscopic. Yet this is only true up to a point. When teachers talk of electrons orbiting a nucleus they are actually invoking a macroscopic *analogy* for the microscopic system that they are describing. It is relatively easy to make this clear by saying “one way of imagining this is to think of it like…” If we make it explicit that we are not describing the situation *literally* then we avoid students feeling cheated and lied to when we later propose other models. It also gives a sense of how science really proceeds. I have had many non-scientists explain to me that scientific theories are disproved over time and that science is therefore a nonsense. However, theories such as Newton’s laws, which have been superseded, still model reality extremely well in the circumstances that they were first developed in order to model. Also there is superseded in part or whole, just because one part of theory is changed does not mean that every aspect of it is wrong!! However, it is lack of subject knowledge that leads to opinions like these. Thanks for the interesting read. I am preparing a blog (or series of blogs) on the curriculum, including the concept of coherence, which has been referenced by the Assessment Without Levels report, and Tim Oates’ Could do better. It seems to me that there is much confusion around the term. I largely agree with how you use it – basically, that our learning objectives should cohere. The Assessment Without Levels report uses it more often to refer to the alignment of the curriculum with assessment and other aspects of educational provision, like textbooks. To me, coherence is an internal property (as you suggest), while alignment is external. The muddle between the two uses of the term, in my view, reflects a deep-seated confusion in what we mean by the curriculum. Does it refer to our learning objectives (whatever they are) – or does it refer to how we achieve those objectives? My own view is that we need to decouple ends and means much more clearly – because we need to move on from saying that that what happens in school happens because that is what we do – to being able to justify what happens in schools because it is the best way of achieving what are more widely endorsed objectives. Your example is interesting, I think, in drawing attention to a middle ground, or to what I would call intermediate objectives. You could go from A (ignorance) to B (mastery) via the fork in the road, the telephone box and the pub; or alternatively via the grocers, the bus stop and the bridge. The route represents a method of getting from A to B, but itself consists of intermediary objectives. Obviously the school does not work efficiently when teacher 1 starts the child of on route A, and their next year’s teacher gets them to spend 6 months traversing over onto route B. But aligning routes is what I would call coherent pedagogy rather than a coherent curriculum (using “curriculum” to refer to objectives and not methods). And if you think I am misusing words, then I think it is because our terminology is inadequate to discuss this issue properly. Which is why I am taking so long to write my post on this subject! Excellent post. As a parent, I am forever frustrated by the different styles of teaching that my daughter is expected to adapt to, in order to progress.